Non-profit organizations can offer a low-risk and highly collaborative route for young or beginning farmers to enter into agriculture. Neither Emma nor myself grew up on a farm or received significant agricultural training during childhood. This lack of exposure has led to steep learning curves in what we might now consider the “basics” of an agricultural lifestyle or ethic. In the face of these difficulties, we have sought out both practical and philosophical advice from a host of mentors, role models, and genuine friends to help guide us along our unorthodox farming path. 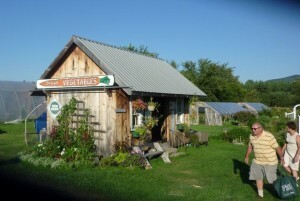 Currently farming in New Hampshire, we understand our journey to this point as one defined by a collaborative, collective, and community-based approach, utilizing the often under-tapped resources of non-profit organizations to further the cause of an agriculture that emphasizes both human and biological diversity as its foundation. In brief, the places where we have felt empowered through group education and experimentation include the F.H. King Student Organic Farm and the Eagle Heights Community Gardens on the University of Wisconsin-Madison campus, the various farms we have apprenticed on in Maine and Massachusetts, and our current position as farm managers at The Community School in Tamworth, New Hampshire, a small, independent day-school for middle and high school students. All of these experiences have required constant communication and cooperation between many different people and, though often strangers at first, through shared effort we have grown food, relationships, and community. 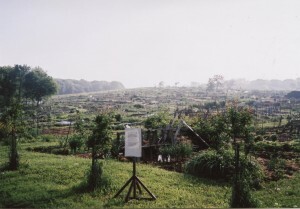 While our path may be different than traditional ways of entering into farming, we feel that it represents an increasingly common situation in today’s social landscape, where young, college-educated adults want to impact or change the dominant industrial agricultural system, but find the resources and capital required to do so prohibitive. The prospect of long-term debt can cripple one’s enthusiasm. Thus far in our journey, though, non-profits have enabled us to deepen our knowledge and skills while mitigating the financial risks we might have otherwise faced. By providing land, infrastructure, and steady income, our partnerships with organizations diversifying into agriculture have yielded invaluable experiences while building confidence without eroding our financial well-being. Bookkeeping and a nose for business—necessary skills for any established, successful farmer—may not come naturally to some who dream of growing nutritious food, but these intangibles keep an organization like The Community School afloat. Young or beginning farmers working within organizations have the opportunity to develop and hone these skills through budget planning with fellow staff members who may have years of financial management experience. By working alongside knowledgeable co-workers, beginning farmers may see and appreciate how a collaborative approach to farm and land management prepares them for long-term success. The manifold responsibilities of running a farm do not fall on the shoulders of a single, inexperienced individual, but rather get distributed amongst various people all committed to the success of the farm. As employees and apprentices at several small farms, we have seen first-hand the effort, accounting skill-set, and the increasingly sophisticated software or technology needed to effectively manage a small business. The workload can seem daunting without the right material or tools at hand. Farming at non-profits can therefore provide a sort of incubator for the ambitious but novice entrepreneur, expanding his or her understanding and acumen for the nuances of running a business without a list of responsibilities beyond their comfort-zone. The many advantages of farming at a non-profit do not come, however, without some difficulties and responsibilities that an independent farmer might not have to face. Lines of communication with the many different people involved in the organization must remain open and require care and understanding to ensure that they facilitate economically and ecologically sound farming. Mutual respect and a clear sense of shared purpose must underlie good communication and, in turn, healthy working relationships. When trying to cooperatively manage a farm, this means that everyone involved in the decision-making process, from the executive director down to the farmer, must have an accurate sense of the difficulties faced in farming. Administrators cannot create unrealistic expectations for the farm and must realize that agricultural success requires patience as a farmer learns the nuances of a piece of land: how the fertility builds, rotations develop, and markets grow. To support a farm is a long-term investment and should be seen as such; the costs may prove steep at first, but if done well will bear fruit and recognition for years. The school provides the infrastructure and land for the farmer to grow certified organic produce. CSA members in the foreground leave with bags full of fresh vegetables. Likewise, non-profit farmers must also have patience. Developing the ability to balance the many opinions and emotional connections some community members have to the land will go a long way towards successful stewardship. Bridging the potential gaps in understanding between farmers and administrators often lies in communicative solutions. Not everyone may consider all the variables involved with farm management, but, then again, that is why they chose you to manage their farm. In order to play their role in the larger organizational framework, farmers must be willing to dig through problems that have little to do with the actual growing of crops and more to do with institutional function. Organizations can move slowly when making decisions because they need input from so many people. Although, from a farmer’s perspective, efficiency may be lost, he or she must also realize that on-farm efficiency may take on less importance than organizational cohesion. Non-profit farming provides an attractive model for many reasons. It can enable organizations with an appropriate land-base to diversify their revenue stream as well as to draw in supporters from the community interested in agriculture. Producing fresh food can prove an invaluable and much-needed service to the local community, filling a social niche in which people can be empowered. Mitigating the risks inherent in farming allows for young or beginning farmers to lay the foundation of a career without incurring debt; this will become an increasingly important role for organizations to step into as individuals with farming experience and a college education, but marginal access to additional resources, search for non-traditional ways to start farming careers. Farming for and with others is a complicated and difficult undertaking. Indeed, high farmer turnover has emerged as a barrier to sustained success for some non-profits. But while difficulties remain and experiences going forward will vary, the focus on collective cultivation and truly community supported agriculture yields benefits that extend far beyond any one farmer or organization. As beginning and young farmers, our agricultural education has relied on the open-mindedness of people and organizations alike who realize that, in order to cultivate and preserve the next generation of farmers, it takes cooperation at all levels to teach those ready and willing to learn. John Welton manages The Community School Farm in Tamworth, NH and is currently a NOFA-NH Journeyperson. He can be reached at 603-323-7000 or farm@communityschoolnh.org. For more information on The Community School, call 603-323-7000 or visit the website: www.communityschoolnh.org. I found this site, just beginning my research. I have land in Southern Indian that has not been farmed since just before my grandfather died in 1996. I want to see it grow food again. I was thinking of leasing it, very cheaply, to a non profit organization, as I know so little about agriculture myself. I do want to volunteer and do some farm work my self. Can Cornell, or anyone, help put me in contact with an organization that might be interested? I would try contacting agricultural service organizations closer to your farm. Purdue Extension might be a good place to start, or the Indiana Farm Bureau. I was thinking about starting a non profit farm to help homeless veterans and any veteran who are interested in learning to farm. Unfortunately there is no school near me that has any kind of agricultural classes and there are none that I know of that teaches farming at all. What is the best legal venue for joint ownership of non productive rural cattle and timber land? What is the best legal venue for group rural land ownership? I would recommend reaching out with both your inquiries to the author of the article John Welton. He can be reached at 603-323-7000 or farm@communityschoolnh.org.